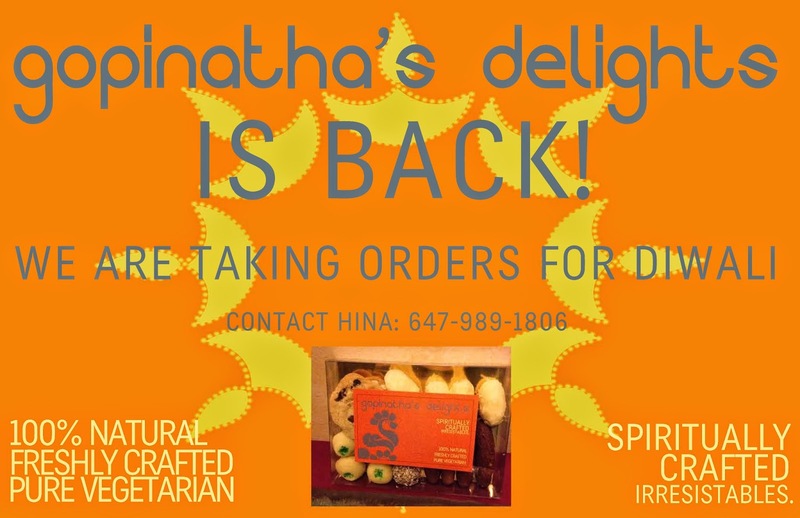 Gopinath's Delights is Back for Diwali! ~ The Toronto Hare Krishna Temple! Gopinath's Delights is Back for Diwali! Diwali, also known as "festival of lights" (23rd of October), spiritually signifies the defeat of darkness / ignorance over light / knowledge. It is merely two weeks away and as is tradition, gifts (usually sweets) are exchanged amongst friends and family. Gopinath's Delights has been serving you (on Diwali and Christmas) since 2011. We're now back- with more variety- and are pleased to inform you that we've started taking orders. For your convenience, we have four sizes: $5, $10, $15 and $20 sweet boxes. Each box comes with a free book*. Weekly sales have also been on for the past two Sundays and will go on for the next two weeksl; please check us out in the main hallway! Sri Sri Radha Ksir-Chor Gopinath with love. Unoffered and sugar- / gluten- free sweets can also be prepared upon request.